Libya’s Loay al-Magri offered a more substantive vision of the aspirations of the country’s youth. Demands have been made for the swift establishment of the rule of law with no ethnic distinctions. This should be accompanied by social and economic policies that review Libya’s education system, encourage vocational training, redevelop the commercial sector and revitalize the jobs market. It is also hoped that a full and frank exchange of ideas across Libyan society will result in similarly proactive foreign policies. 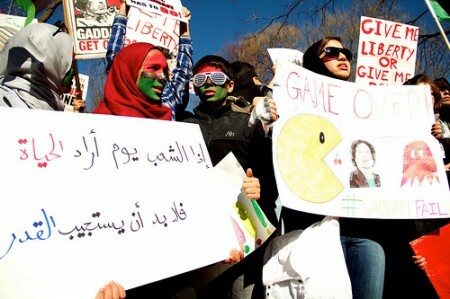 It remains to be seen whether the recent death of Muammar Gaddafi will accelerate or temporarily derail these ambitions. One of the defining features of the Arab spring has been the use of social media to criticize government policies and organize dissent. As the clamor for regime change began in Tunisia perhaps it is no surprise that Sofiane Belhaj offered the fullest account of the importance of social media. Blogging allowed many Tunisians to practice ‘cyber dissidence’ that circumvented state-controlled media and challenge the Ben Ali regime with relative anonymity. When the government attempted to restrict the use of social networks, many simply cancelled contracts with internet service providers with close links to the regime. As the government was forced to lift restrictions, Facebook and Twitter were increasingly used to orchestrate protests. State repression is also a defining feature of political unrest, and the Arab spring was no exception to the rule. Yemen’s Hend Nasiri said that opposition against the rule of Ali Abdallah Saleh was initially led by the country’s youth. But when Islamic extremists joined the opposition movement, state security forces had their justification for crushing dissent. Repression has also resulted in the suspension of everyday activities like attending university and the arrest and torture of family and friends. In the case of the Syria’s Lubna A, opposition to the Assad regime has resulted in a life in exile under an assumed identity. While Bahrain is the smallest state to experience upheaval, the response of the regime has possibly had the most dramatic effect. Like their Yemeni counterparts, Bahrain’s ruling Al Khalifah dynasty has used the threat of Islamic extremism as justification for repressive measures. As a result, Bahrain has experienced the highest numbers of deaths and detentions per capita than any other Arab spring state. Maryam al-Khawaja offered a word of caution was also offered against ignoring political unrest in Bahrain. The fall of Bahrain into the hands of its Shia majority could inspire ethnic unrest throughout the region. Its eventual outcome may far outweigh any benefits accrued during the Arab spring. The young activists’ continued determination to improve social, political and economic conditions in their countries was certainly impressive. None have lost sight of the magnitude of the task facing them. For some, the challenge is building state institutions free from the influence of previous regimes. For others, the task remains to overthrow the ruling dynasty. This may yet result in a very ugly looking ‘Arab autumn’.